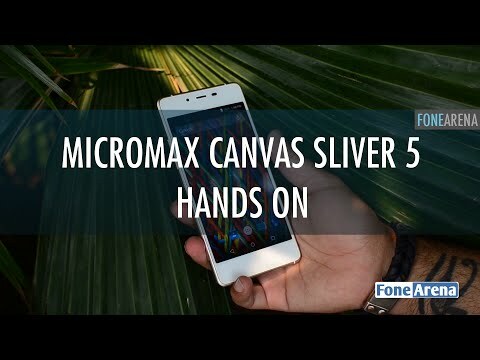 If you own Micromax Canvas Sliver 5 Q450, please do leave your feedback too. The Canvas 5 Sliver is the slimmest phone from Micromax. Most of you would get its name wrong - It is called Sliver and not Silver! It is 5.1mm thick, weighs 97gms, so we clearly know what was Micromax aiming for. On the front of the device there is a 4.8 720p AMOLED display. Meaning, it would give great level of saturation. Display is protected by Gorilla Glass 3 to protect it from every day's wear and tear. What's more interesting is that they used the Oncell technology that we've seen in the OnePlus One - this further helped to slim down the phone. If the display was the best from Samsung, camera in the Micromax Sliver 5 comes from Sony. It features an IMX 219 Sony sensor that we've seen on the Xiaomi Mi4, so we know it wont disappoint like other Micromax phones. To make it more multimedia rich, it has some great software driven amplifications like NXP smart and Direct HD Sound. All of this makes it a feature packed multimedia phone. On the processor side, a Snapdragon 410 Processor running at 1.2GHz is present. To handle all the 720p graphics, it features an Adreno 306GPU. For multitasking, there is a 2GB RAM. All of this is backed by Android 5.0. For us, thats the only thing bad about this phone as Micromax is pretty slow at pushing updates and there is no sight of them pushing an Android 5.1 update anytime soon. Powering it up is a 2000mAh battery. Its a decent size considering the thickness of this phone.